Our fleet of trailers can transport up to 2.7T making them a great option for transporting any Slab Scissor Lifts. Available for short term hire with equipment, these create a perfect way to cart equipment from site to site yourself. 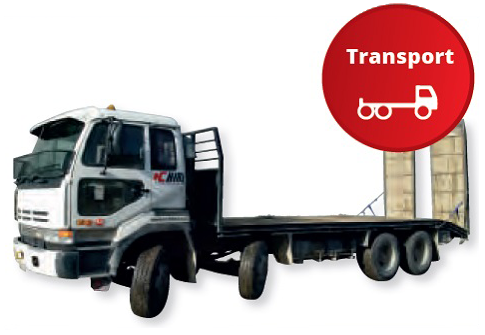 Our mid range of trucks share the ability to transport up to 6.5T. With sliding decks and a short wheel base makes them ideal for sites where access is tight. Our ‘Heavy Traffc’ Range of trucks will cart up to 15T, including our large booms or multiple smaller units.